The 2012 image (bottom) is the most detailed picture to date of a large, edge-on, gas-and-dust disk encircling the 20-million year-old star Beta Pictoris. The 1997 Hubble image (top) shows the disk’s dust distribution has barely changed over 15 years. Using NASA’s Hubble Space Telescope, astronomers have captured the most detailed picture to date of a large disk of gas and dust encircling the 20 million-year-old star Beta Pictoris. The new visible-light Hubble image traces the disk to within about 650 million miles of the star. The giant planet orbits at 900 million miles, and was directly imaged in infrared light by the European Southern Observatory’s Very Large Telescope six years ago. “Some computer simulations predicted a complicated structure for the inner disk due to the gravitational pull by the giant planet. The new images reveal the inner disk and confirm the predicted structures. This finding validates models that will help us to deduce the presence of other exoplanets in other disks,” said Daniel Apai of the University of Arizona, Tucson. These structures include a warp in the inner disk caused by the giant planet. When comparing the latest 2012 images to Hubble images taken in 1997, astronomers find that the disk’s dust distribution has barely changed over 15 years despite the fact that the entire structure is orbiting the star like a carousel. This means the disk’s structure is smooth and continuous, at least over the interval between the Hubble observations. The disk is easily seen because of its edge-on angle, and is especially bright due to a very large amount of starlight-scattering dust. What’s more, Beta Pictoris is 63 light-years away, closer to Earth than most of the other known disk systems. 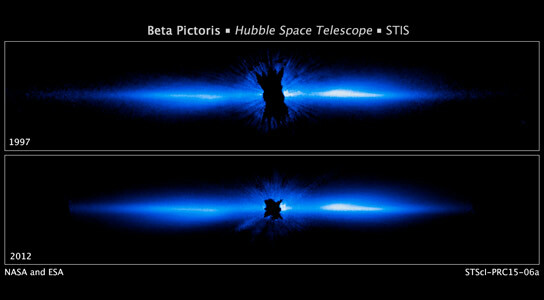 Be the first to comment on "Hubble Reveals Detailed View of Circumstellar Debris Disk Encircling Beta Pictoris"